Daniel Ricciardo surprisingly won the Canadian Grand Prix in what was a thrilling event from start to finish. A pass on Rosberg secured him his first career win while Rosberg ended second, just ahead of Vettel. Race day is much hotter than Friday and Saturday here in Montreal with the track temperature of 50°C at the start posing an additional problem for the cars. As the lights lights went out, Hamilton took the better start and had the lead into the braking for turn 1. Rosberg though had the inside of the turn thanks to starting from pole. He locked his front left wheel and got the edge into turn 1. His exit though was so wide that Hamilton had nowhere to go, slowed down to avoid an incident and then saw Vettel sneek ahead. 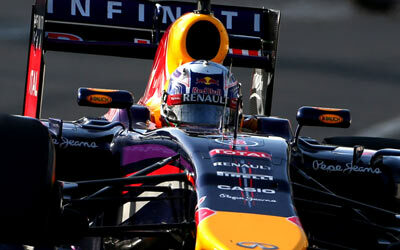 Bottas behind took 4th, ahead of Massa, Ricciardo, Vergne, Alonso, Raikkonen, Button and Perez. More to the back, Chilton oversteered badly into turn 3, eventually sliding into Bianchi, taking both Marussia's out in the same move. Not only is this the first non-finish for Chilton, but it's also a very costly one for the team as Bianchi's Marussia turned out badly damaged following the severe rearward hit into the concrete wall. With so much debris on the track, a safety car was inevitable, a welcome surprise for most runners as this allowed a number of fuel saving laps in a race where teams know fuel consumption is a real limiting factor. At the end of lap one Gutierrez is immediately into the pits, taking on a new set of super softs. Surprsingly, he returned to the pits another lap later, switching to the soft tyres. The Sauber driver was already running last, so there's no penalty there at all. On lap 8, the racing is back on as the track got cleared. Rosberg stepped on the throttle halfway through the straight leading into the final turn and effectively surprised the entire field, ensuring an 8 tenths lead at the crossing of the finish line. Hamilton was caught asleep as well and was tutally unable to take up a fight with Vettel. On lap 10, the first with DRS enabled, Hamilton easily passes Vettel to take back second place. Moments later, Ericsson comes into the pits and abandons the race with a power unit issue. On lap 12 Bottas reports rear tyre graining. Massa just behind appeared to have the same issue as Daniel Ricciardo consistently looked for an opportunity to get past the Brazilian. Failing to do that due to the excellent top speed of the Williams, the Australian dove into the pitlane on lap 14 to change to prime tyres. One lap later, Bottas and Button also pit, followed by Vettel, Massa and Vergne one lap later. Alonso pits another lap later and rejoins the track just ahead of Vergne, gaining back the place he lost at the start. On lap 18 Rosberg pitted for soft tyres and subsequently nearly hit the wall in turn 3, underestimating the effect of fresh tyres. One lap later Hamilton pitted as well, rejoining 2.7 seconds down on Rosberg. On lap 20, positions are Rosberg, Hamilton, Perez, Hulkenberg, Vettel, Bottas, Ricciardo, Maldonado, Alonso, Vergne, Massa, Kvyat, Raikkonen, Button, Magnussen, Gutierrez, Grosjean, Sutil and Kobayashi. Perez on the super soft and Hulkenberg on the soft both haven't pitted yet, similar to Maldonado in 8th. By lap 24, Hamilton reduced the gap to Rosberg down to 7 tenths thanks to 3 subsequent fastest laps. On lap 25 Kobayashi abandons the race with a broken rear track rod. He first spun in turn 2, but when getting his car pointing again in the right direction, he found his left rear wheel pointing the wrong way, making it unable for him to continue. Moments earlier Hamilton got well under the rear wing of Rosberg towards the end of the straight, resulting in a bad lockup by Rosberg, forcing him to go straight on through the chicane. Even though that didn't gain him a position, the gap between the two increased by approximately a second, triggering an investigation from the stewards for disrespecting the track limits. Hamilton though soon closed the gap again, having the upper edge in the first and third sector. Meanwhile, Vettel is still stuck behind Hulkenberg and got company of Bottas. Perez at the same time is 2.5s ahead on his super softs, seemingly not struggling to keep life in those tyres. In fact he is told over the radio that the team decided to extend that first stint past 30 laps. Perez only pitted to change for softs at the halfway point, on lap 35 to be exact. By that time, Ricciardo joined the group being Hulkenberg, Vettel and Bottas. On lap 36 Bottas pitted for another set of primes, breaking out of the Hulkenberg pack but instead stuck behind Raikkonen and Button. On lap 37 and 38, Vettel and Ricciardo pitted, resulting in Ricciardo gaining a place on Vettel. Ricciardo is 8th and Vettel 9th, a second ahead of Raikkonen and Bottas. At the front, Hamilton first reported a power issue, half a lap later followed by Rosberg complaining of a similar drop of power. By lap 41, Rosberg's advantage is down again to 0.6 seconds, but the two are lapping 3 seconds a lap slower than they were before their issues. That's 1 second slower than Hulkenberg in third and 2 seconds slower than Massa in fourth, both of which are following approximately 20 seconds down on the Mercedes pair. On lap 42 Hulkenberg pits and rejoins the track in 8th, in between Vettel and Bottas. Raikkonen dropped out of that pack as he spun in the hairpin, ending up down in 15th place. At the same time as Massa is told to try to make his softs last until the end of the race, Rosberg pits, as well as Alonso. Rosberg rejoined the track just behind Massa due to a sluggish pitstop. One lap later Hamilton is in the pits and rejoins just behind Massa while Rosberg dropped to third, mostly because of Hamilton's much faster pitstop. Half a lap later, Hamilton goes wide through the hairpin and straight on through the final chicane. He immediately lets Rosberg past and returns to the pitlane at the end of thaat lap with a smoking right rear wheel. It appears like the brakes failed as Hamilton is immediately pulled into the box. While Massa decides to pit nonetheless, dropping down to 7th, Rosberg is told to reset his engine mode yet again and request to preserve the brakes to make sure he at least makes it to the end. On lap 53 of 70, the top 4 is within 2 seconds first to fourth while Hulkenberg in 5th is also leading a close pack of 4 cars including Bottas in 6th, Massa 7th and Alonso in 8th. They are down 3.5s on Vettel and running virtually the same pace. On lap 56 Bottas is told to allow Massa through, given that the Brazilian is on much fresher tyres. Bottas then tried to pass Hulkenberg ahead, but by going wide, he let Hulkenberg and Massa past, also allowing Massa to make a pass on Hulkenberg at the end of the straight. The next few laps showed why the position switch was a good move as Massa soon posted a fastest lap, easily a second quicker than the cars ahead. Alonso soon follows suit and gets ahead of Bottas on lap 60, braking later than the Finn on the entry of turn 1. At the end of lap 60, Grosjean abandons the race, joining Kvyat, Hamilton, Kobayashi, Maldonado, Ericsson and the Marussia's to get out of their cars earlier than expected. By the start of lap 63, Massa has joined the leading group and has the best top speed of all, but he's got no DRS advantage as all three cars ahead do have that option as well. 5 laps from the end, Perez reports a brake issue and is soon passed by Ricciardo in turn 1. 3 laps later Ricciardo takes the lead while Vettel and Massa are still stuck behind Perez. 3 further seconds down, Hulkenberg is chased by Alonso and Button. On the penultimate lap, Vettel finally gets past the Force India through the straight. In the subsequent turn 1, Massa attempts to pass Perez as well, but somehow Massa hit Perez' left rear with his own right front, sending them both off in violent crashes. It appeared as if Perez went slightly to the left while braking early, surprising Massa and causing the crash. Both men are fortunately unhurt, but their big haul of points was obviously gone. Button meanwhile managed to get past both Alonso and Hulkenberg in the final three laps, moving up into fourth, thanks to an impressive final stint. In the end, an eventual race makes for a surprising winner. It's the very first, but an extremely well deserved one for Daniel Ricciardo, the first non-Mercedes driver this year to win a race.